Online registration is now closed. If you would like to participate in the Nantasket Polar Plunge, you can register on-site starting at 10AM. Online donations will still be accepted before and after the plunge. New date: Sunday, March 24th, same time. After a dramatic change in this Saturday’s forecast, our public safety partners at the Department of Conservation and Recreation (our permitting authority for state beaches), local police, fire, and parks departments confirmed this morning that due to the potentially severe weather, we are going to have to postpone Saturday’s Polar Plunge scheduled for Nantasket Beach in Hull. Our primary concern is the safety of everyone involved in these events including the Plunge participants, spectators, rescue divers, and local public safety officials. 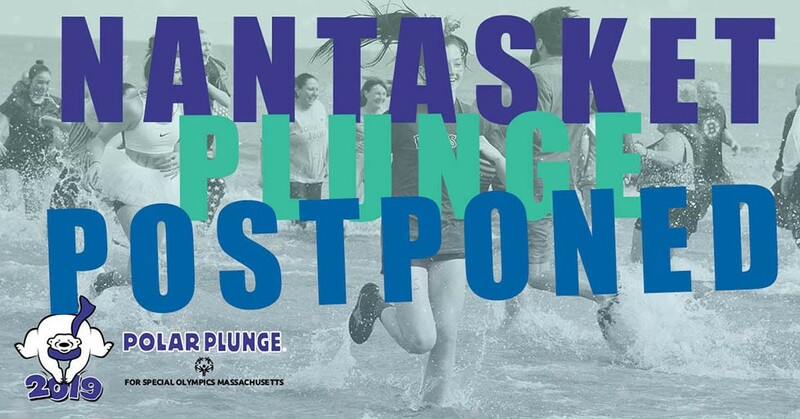 Please email us or call 508-485-0986 with any questions and if the new date does not work for you, we have 6 other plunges throughout the state that we can transfer you too. Online Registration will stay open until Friday, March 22nd and donations are still being accepted. We are in the middle of celebrating the 50th anniversary of Special Olympics and you can get in on the fun with the COOLEST way to be involved. Since 1968 Special Olympics has provided athletic opportunities for individuals with intellectual disabilities. In celebrating the 50 years, our goal is to reach 2,418 more athletes in 2019 and provide the opportunity to showcase their abilities on and off the field of play.